Nammal Thammil is a popular talk show in Asianet anchored by R.Sreekandan Nair. You can read more details about the show Nammal Thammil and its anchor R.Sreekandan Nair from here. 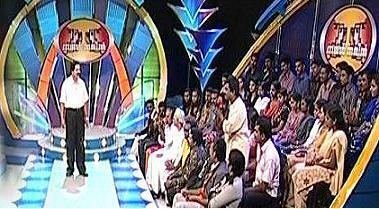 Nammal Thammil is one among the most popular talk shows in malayalam television. In 'Nammal Thammil' everyone participating in the show gets a chance to express there views on the topic discussed. A wide variety of topics are discussed in Nammal Thammil, like condition of roads in Kerala, Kerala lottery, astrology, politics etc. This show has already completed more than 640 episodes and is continuing its journey. The anchor of this talk show is R.Sreekandan Nair and he is also the vice-president of Asianet. The 'Nammal Thammil' talk show is telecasted in Asianet on every Saturdays at 10 PM. Idea star singer is the most popular reality show in malayalam and Idea star singer season 4 (2009) is the current show running in Asianet. Watch and download online free videos from Idea Star Singer Season 4. R.Sreekandan Nair is the vice president of Asianet and the anchor of famous talk show 'Nammal Thammil' in Asianet. You can read more information about R.Sreekandan Nair from this article. Anju Joseph from Kottayam is one among the finalist of Idea Star singer season 4. Read more about Anju Joseph and watch and download photos and videos of Anju Joseph. Joby John from Kozhikode is an Idea Star singer finalist. Read more about Joby John and watch and download photos and videos of Joby John from here. It is a very good programme to understand each other and shairing their visions of various subjects.